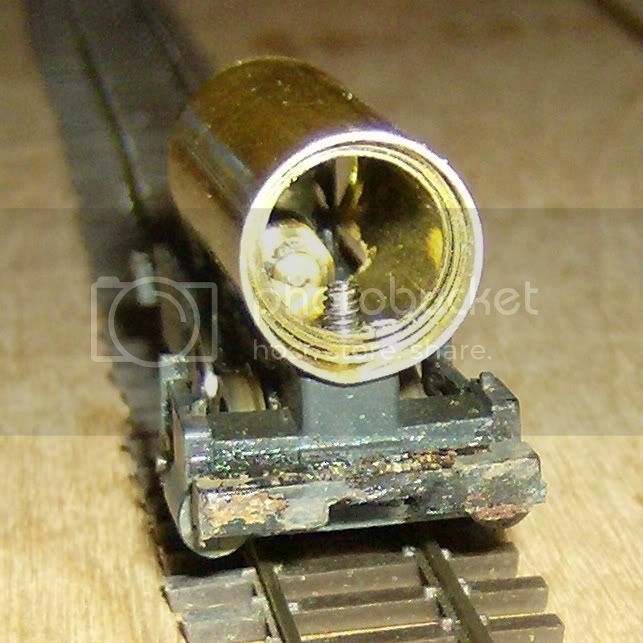 I'm going to attempt to build a model of the locomotive in this thread. 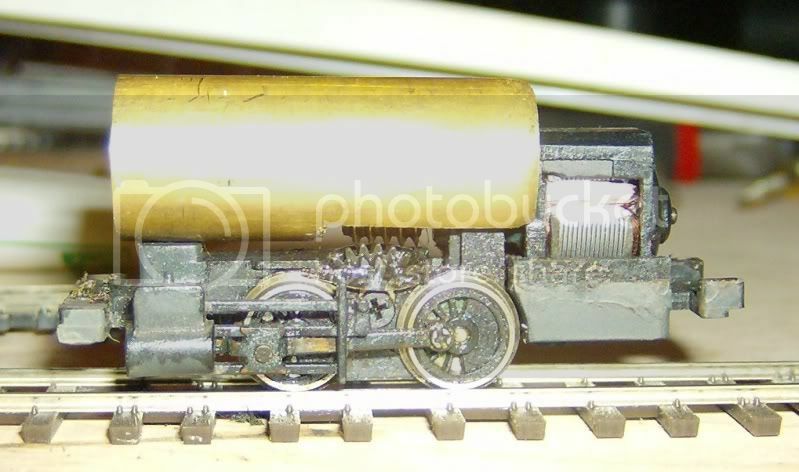 The chassis is from a Bachmann N scale 0-4-0T. I had previously built a HOn30 Porter with it. It was fun for a while - but the layout is no longer. I wanted to build some narrow gauge locomotives for my Ffarquhar project - this is my first go at it. I scaled it to match my wheel base. I understand that this may not be exact to scale in all directions - but by matching the wheels to the overall length, I feel I'll get something that looks proportionally right. I had a face for Duncan taken off a toy. The boiler diameter was determined by that face. This ended up being larger than the prototype - but mine sits lower on the chassis, so the height works out well for my purposes. The extra thickness gave me a good bit of thread for the screw that comes up through the saddle. Here's Duncan with an older HOn30 locomotive I also plan to convert. I'll post more as work progresses. This looks like it should be a good project and a nice start as well. The extra tubes will give it a bit of traction too. This looks like a good one to watch Rick. Keep up the good progress. Today I got a start on the funnel. It's another piece of brass tubing I had in my scrap box (so far everything has been made with scrap from earlier projects). I wanted to epoxy this part in place, but when I went to open my 5 minute epoxy, I found one part had totally evaporated. All I had left was 30 minute epoxy (which I use for wood and card models). I didn't want to wait 30 minutes so I used Walther's Goo. I've used this before with good results - but it took about an hour to dry. Notice the short length of tube to the right? One thing I noticed in the photos I posted yesterday was that the boiler wasn't level (go ahead and look). So found a piece of scrap tubing that brought me within a few hundredths of inch of level (got to love a digital caliper!). It will be inside the cab, so it won't be seen that well. I'll just work it into the backhead detail. 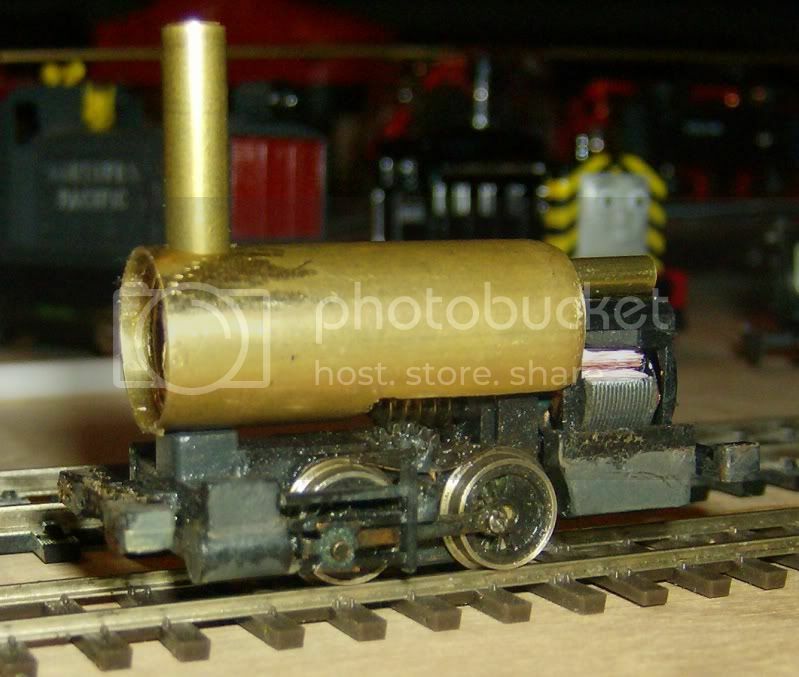 Also notice the skitter marks across the smoke box? That's me being stupid. I know the right way to drill out metal like this - but I was impatient. Learn from my mistake! Start with a small drill and work your way up to the full size. The larger drill wouldn't stay put and caused those skitter marks. So I went though a series of smaller drills, checking the angle each time and making adjustments as needed. Next I'll put decorative trim at the top of the funnel and shoulder trim on the bottom. Then maybe the domes. Important note: Walther's Goo is NOT the best glue for this project. 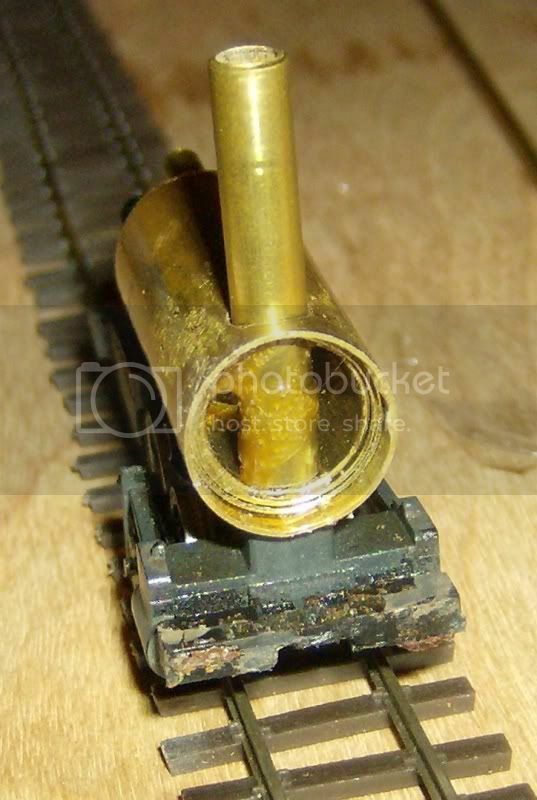 It held the funnel okay - but the clearance was so tight through the smokebox it probably wasn't going anywhere anyway. But the little shim tube was still rubbery this morning. It may not come loose - but I don't want to take a chance. So I've troweled in some 30 minute epoxy on top of the Goo. That should hold it. 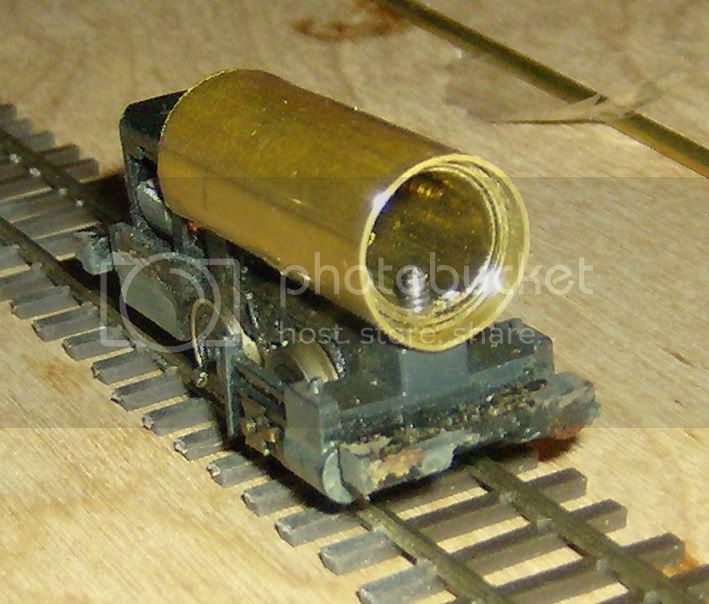 Looks good Rick this little loco, sounds like lot of fun to build. 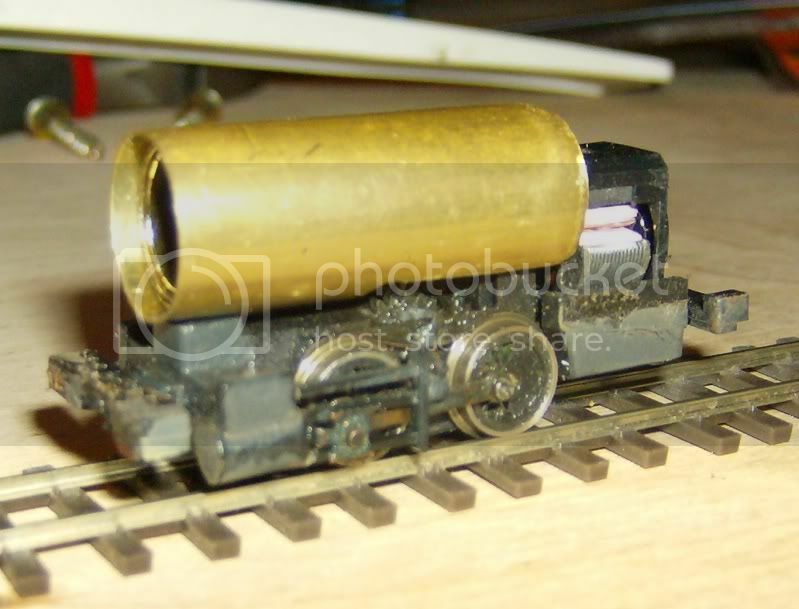 And even if some things (larger boiler or wheels) are not like the prototype, I think it's better having something not 100% prototypical than having nothing at all. It's all coming together and looking good Rick. And remember that the real loco's were that size because there makers decided to make them that size. A different manufacturer may have used a smaller or larger boiler or wheel sets of a different dimension and a longer or shorter overall length so if it looks right to you it is right. Yeah - you're right - there really isn't much of a "standard" with these things - at least that's what my modest research shows. By the way - 30 minute epoxy takes at least 60 minutes to dry. But it's a lot stronger now. Now to tackle the funnel trim. Nice work so far there Rick, keep it up. I'm talking about the transition piece at the bottom of the funnel on top of the smokebox. Note: this isn't the same locomotive, but it's the idea I'm looking for. If I can't do this, I may just try a straight tube around the bottom of the funnel.